A recent comment and request from one of my readers made me realise that I never posted on how to adjust a front derailleur. This is because none of my rides presently have one of these and I just simply forgot about it. So here we go, excuse the crappy pictures, but with the weather I'm stuck indoors and I haven't figured out how to take good ones inside....yet. The front derailleur is a simple thingamabob that is springloaded and pulled by a cable to push the chain on the gear you want at the pedals. 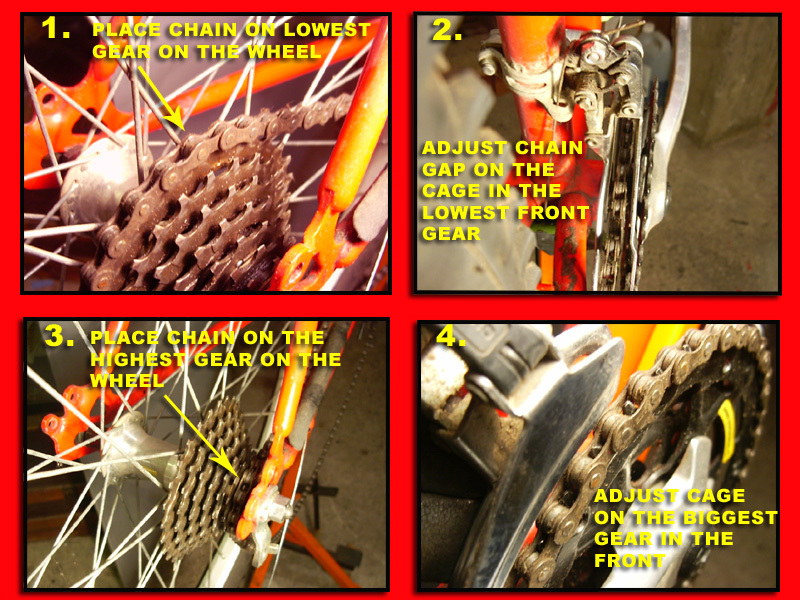 This how-to applies for 2 and 3 gear chain rings. Once you've adjusted with my method, the middle one should take care of itself on a 3 gear set up. Before you begin, there are a few things to verify. First, make sure the derailleur cage is aligned with the chainring gears. Second, make sure the height is correct by pushing the cage with your hand towards you to make sure that it doesn't hit that last gear. 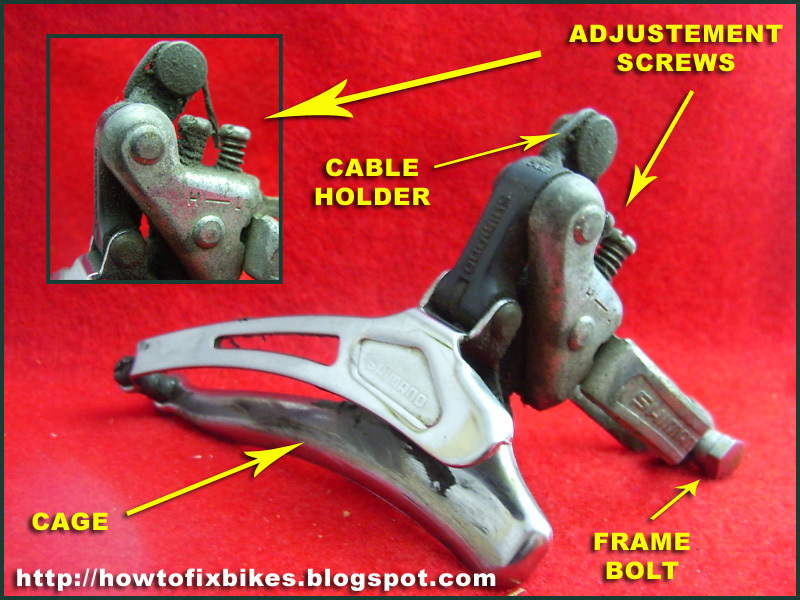 If you need to move the derailleur, undo the cable and loosen the frame bolt and make the necessary adjustements. There, I just saved you at least 45 minutes of yelling, screaming and swearing! Next, don't bother doing any adjustements before removing the cable from the derailleur. Let's start fresh. At the same time, verify that the cable is moving freely. Cables that are housed in a sleeve up to the derailleur sometimes have a nasty habit of jamming. What happens is that the sleeve's opening points upward on the derailleur and invites water in to deposit itself in there and marries it and the cable with a generous amount of rust. Replace cable and sleeve if that is the case. Ok, derailleur moves freely by pulling it with your hands and the cable moves freely. Now keep the cable disconnected and put the shifter in the lowest gear position. Your chain should rest on the gear closest to the frame on the chainring(that's the name of the gears attached to the pedals)if you turn the pedals. Next, shift the rear derailleur to the lowest gear in the back. That's the gear closest to the wheel spokes. Now look at the clearance between the inside of the front derailleur cage(closest to the frame) and see if you have a small gap between the chain and the cage. If the chain is rubbing on it or the gap is too wide, take a screwdriver and adjust the "L" screw on top of the derailleur. Turn the screw until you are satisfied with the results. Clockwise should push the cage outward and counterclockwise inward. Now to verify that your gap is not too big, leave the chain on the lowest gear on the chainring and shift the rear derailleur to the highest gear, that's the one closest to the frame. If your adjustement is good, the chain shouldn't rub on the outside wall of the front derailleur cage. Lastly, reinstall the cable and with keeping the chain on the highest gear in the back, shift the front derailleur to the biggest chainring while turning the pedals. Did the chain completely come off the chainring? That's because the front derailleur cage went too far and pushed the chain off. You will need to turn the adjustement screw "H" clockwise until the derailleur stops just before pushing the chain off the chainring. The reverse is true if the cage doesn't go far enough and the chain refuses to go on the last chainring. Gerry, great blog. I'm having a major problem with my mountain bike, and this problem is specific to when I'm riding it on trails. When I apply any kind of torque, like when I'm going up a steep hill or wheeling over a log, the chain pops right off the chain ring. It used to do this only once in awhile but it's been getting worse and worse, now it's to the point where I can't ride it. I'd hate to scrape this bike, I've had for years and I love it. I know I've got to replace the chain and adjust the derailers, is there anything else you recommend I check? It's hard for me to diagnose the problem from here, but this is what I think. You might have a bent chainring. From what you're telling me this bike has a lot of mileage and you've used it off road often, so it's a distinct possibility. Take the chain off the chain ring, turn it with the chain off and watch to see if it is crooked at all. It could also be that your frame is weak and flexes too much when the pedals are under power, but I doubt that. Changing the chain is a very good idea since it will keep everything tight. You may have used up the teeth on the chainring as well, especially if it's made from aluminium. But I would verify my first guess. Good luck and whatever you do, don't toss that bike. At the very worst keep it around for spare parts. I recently removed old one because it was broken and I got replacement cable. Now I just can't get the cable back on. I have given up and I am without the bike. I put the front gear at #1. Installed cable somewhat loosely. Then I tried it and I could barely get into 2nd gear all the while chain never moved up. I tried putting cable on tight and I couldn't get it to 2nd gear at all. Either way, chain or cage refuses to move. Any help is appreciated. Or tell me how much bike repair shop charges to repair it? I've been able to get the chain to goto Level 1 gear but when I change gears, it goes straight to Level 3. Cable pulls to tight on the cage and pulls the cage to level 3. Ok, unhook the cable from the derailleur and play with the shifter to see if it moves freely. If it doesn't, the cable is either snagged somewhere or is not routed properly. You might also have rust inside the cable housing. While the cable is disconnected, use your fingers to see if the cage moves freely. If it doesn't, either the H and L screws are screwed in all the way or the unit is shot and you have to replace it. As far as price goes, shop around since prices vary from shop to shop. But don't give up, front derailleurs rarely die. Keep us posted! Okay, I've gotten gears to change. Unfortunately, the chain either bangs derailleur or the derailleur bangs back tire. I tried to use the two screws to fix it and now gear changing doesn't work at all. Derailleur just won't function properly. I've tried pushing it manually but it just goes back after I change gears and go back. I got this far by loosening the cable slightly. Please send me pics of your derailleur, cable, shifter at xddorox@gmail.com so I can have a better idea of what's going on. Maybe this would help me to help you. I am totally new to bike reparation, it would seem that the cage of my front derailleur catches on the pedal as it goes past, I have stopped riding as I don't want to mess it up even more. I have tried to adjust the front derailleur, no success yet. It's a shimano. Any help would be welcomed. This is an awesome blog, Gerry! My chain is rubbing against the front derailleur, so I'm going to take a crack at the adjustment. I'm assuming the adjustment would be the front but could I be wrong? Thanks pianodood, turn the pedals and watch if the chain is rubbing on the cage of the front derailleur as it passes. If so, that's your booboo right there and your diagnosis is correct. Good luck. The directions were right on. I use to have only one front gear and now I have 3! I wish you could see the big grin on my face right now! I'm happy that this helped you. Have a great day. Gerry, if you can help me with this, I'll be so-o glad! My front derailleur can't seem to hit all three gears. I can only hit the top two or the bottom two. I've played with the cable so much that it's all frayed. There just doesn't seem to be enough play in the system. My derailleur is as low as it can go without hitting the frame. My H and L screws are backed off. What do I do now? Gerry - I'm a little further along now. I pulled the cable. It was frayed at the nut end! Now, I am trying to put in a new cable, but I can't get it to slide into the shifter. Is there a secret? Ok, if your screws are all backed off, your cage might be blocked by something, the derailleur could be busted or you have the wrong derailleur for the job. As for the cable routing into the shifter, it's hard for me to help you out since there are many types of shifters out there. In general they are pretty simple to insert. Just make sure that it is in the first position, gear one in this case. Thank you Gerry. Your note about setting the shifter in first position helped me. I had it in third, and the cable (of course!) just got stuck in the housing. From there everything went fine, except that I still couldn't manage to sweep across all three gears. So I got a light spring clamp to act as a third hand and hold the derailleur to the smallest cog before I tightened the cable. I haven't caught that in most instructions, but it worked for me. Other times,I just tightened the cable and locked it while derailleur was fully compressed. Then I set the lower limit screw, and as a result I lost the full range of motion that the derailleur needed. When I thought about your comments about the screws being backed off, I put two and two together. Now I have all three gears. Your note kept me going when I was ready to quit. Thanks. Fantastic Lucas! I'm happy that you were able to figure it out. Hope this inspires other people to hang on and not quit. Hi Gerry, yeah me too! me too! to what everyone else has said, especially Sonya. I knew very little about bikes beyond changing a tube (and only front tube at that - didn't know how to get the wheel detangled from the chain to do the back!) yet I decided to revive my brother's old mountain bike, which had gone through typical teenager abuse (you've heard of ghost-rider right?). Well after the severely dented wheels were off I could see the rest was in passable shape, but the more bits I took off to clean and check, the more I realized I might as well go all the way and repaint it and fix it up right. Anyway, once the rear wheel was off, I couldn't figure out how to get the chain out from the frame so I cut a link with cutting pliers! Lets just say I got everything OFF the bike without checking the internet. But for expanding my vocabulary (chain tool! ), and getting the new chain on, and the rear derailleur adjusted, your blog did the trick. Merci beaucoup! Hi, my front durellieur is bent because i fell once trying to get up a curb on a road, this is stoping my bike from moving. I'm happy to hear it mate. Glad I could help. I have been trying to adjust my front derailleur. The chain doesn't seem to be rubbing on the gear shifter, but when I put any kind of torque on the pedals, I get a kind of creaking noise as i pedal. When just coasting with little pressure, the noise disappears. If the chain is not rubbing, then your problem is with the bottom bracket bearings or the crank arms, not the front derailleur. Hi Gerry. Thanks for your tips and advice on bikes. I have a question regarding adjusting both the front and rear derailleurs at the same time. When you have to make adjustemnts to both the front and rear derailleurs, which should you start with, the front or rear ? I took your advice regarding disconnecting everything and starting from scratch but am not sure where i should start first to save myself some headaches. Thanks. I would suggest starting with the rear one first. No special reason, I find it easier that way. The rear one being a bit more complex, I always keep the easy jobs for last. You're welcome, it's my pleasure. I have a Jazz mountain bike that I rode maybe 4 times then it sat in the garage for 12 years. I recently pulled it out cleaned it up and noticed the front shifter would only shift from lowest to middle, then the thumb shifter would go limp and not move the chain any more. The bike shop adjusted cables etc,& said I needed a new front deraillieur shifter. Do they break by not being used? 12 years ago it worked fine. Hey Mika, sounds like you need to adjust the "H" screw on your front derailleur. Turn it counterclockwise one turn at a time and see what happens. I'm sure this will fix your problem. Tried adjusting the H screw to no avail. Then tried tightening the cable some more so it would engage the highest crank gear, which worked while i was testing it witht he bike upside down, but once again when I've taken it for a ride, it will not shift into the highest crank gear. The shifter itself gives little resistance, as though it's not pulling the cable as much as it should. I've popped it upside down to retest it all again and occasionally the shifter feels as though it is grabbing the cable and it will shift up a gear, but 90% of the time it doesn't. :( I'm starting to think it's either the shifter or derailleur. The clarity and simplicity of your instructions is commendable. A cub reporter once asked Albert Einstein what the difference was between geniuses and those who are simply intelligent. Dr. Einstein replied, "Intelligent people solve problems; geniuses avoid them." Well, then, I'm no genius. I bought a Park Tool 'jackknife' style Allen key set, thinking it would be the last set of Allen keys I would ever have to buy. Turns out I was wrong: To adjust my front derailleur, I need to get in between the down tube and the back tire. The Park Tool Allen key is too long. I went to the LBS to get a 5mm Allen key, the L-shaped kind that I knew would fit between the tire and the down tube. I rode the three miles to the LBS, having adjusted the front derailleur to run on the middle chain ring. A downhill coast almost all the way. The nice guy at the LBS even gave me the Allen key. Mind you, the ride there was all downhill. What does that mean? Anyone? Anyone? Yep, an uphill ride all the way back. I'm a 43-year-old man who hasn't been on a bike in, well, a long time. After getting home, I dropped the bike on my living room floor, crawled to my bedroom and slept the sleep of the dead for about three hours. Even after I got up I was in no mood to adjust the front d. That would wait until tomorrow. As it will always do, tomorrow came. I went into the living room where my bike still lay on the floor where I dropped it. I turned it up on its handlebars, made sure all was right to make the adjustment and tried to adjust the locking screw on the front d.
It didn't fit. It needed a 4mm key. There is an old carpenter's saying: Measure twice, cut once. There's a new amateur bike repairer's saying: Measure twice, make one trip. That's an epic story Adam. The story of my life. Murphy is always lurking. Hi Gerry, I'm having a problem with my mountain bikes front derailleur not shifting up to the highest (largest) sprocket. I adjust the lowest gear so the chain doesn't rub and the cage is close to, but not touching the chain. 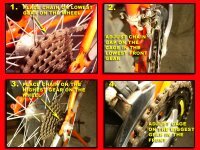 Then I shift to the largest sprocket in the front and the smallest sprocket in the back but I can't get the chain to stop rubbing on the outside of the cage. When I shift back to the lowest gear the derailleur is no longer properly adjusted and the cable is really loose. Any idea what I'm doing wrong? 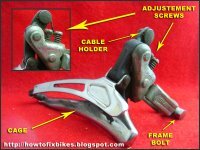 How tight should the cable be when you attach it to the derailleur and where should the L and H screws be set when I begin the adjustment? I don't want to give up yet! But it's REAL hard to change gears. As in, my grip shift, is hard to turn. I can only get to the 2nd sprocket and that's it! Please email me with tips?? I have a 2010 Cervelo S2 with SRAM Rival components. My problem is front shifting mainly going from small to large cranckset. While it shifts perfectly fine when the bike is on a stand but it doesn't shift when I'm riding it or on a trainer. I can see the chain jumping from the small ring to big ring but it will do that for a few miles then eventually it will change. How do you adjust the FD under a load? A front derailleur should not be affected under load. Check if your trainer set-up interferes with the cable. What I meant by that was, when my bike is on the stand I have no problem with the front derailleur shifting from small to large ring but when I hop on the bike and ride it my front derailleur won't shift up at all (it will "eventually"). Something is definitely happening to that cable when on or off that stand. Follow the cable while you operate it on the stand to see if it doesn't clinch somewhere. Once off it might become slack and that's why you can't change gears. Here is the video of my FD issues. One video the bike is on a stand the other while I'm riding it. Let me know what you think.